Calling all New School activists, movement leaders, change-makers and innovators! 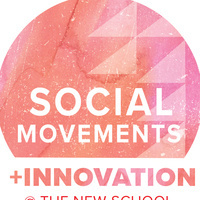 Social Movements + Innovation is a new project on campus that is building a hub for movement leaders, collaborators, and partners to come together and think and act at the intersection of social movements and innovation. We want to co-create the infrastructure 21st-century activists and movement leaders need to do their best work. Join us to learn more about this project, meet the staff and break bread! Breakfast will be served at this event! Social Movements + Innovation is a new project that is building a hub for movement leaders, collaborators, and partners to come together and think and act at the intersection of social movements and innovation. We want to co-create the infrastructure 21st-century activists and movement leaders need to do their best work. By creating a community of practice where we experiment with strategies and build capacity for movement leadership, we can disrupt the status quo and push for the change needed today. Social Movements + Innovation, formerly CoreAlign, is co-led by faculty director, Sujatha Jesudason, Professor of Professional Practice in Management at Milano and executive director Judy Pryor-Ramirez, former director of Lang’s Civic Engagement and Social Justice office. The New School's first activist-in-residence, Shanelle Matthews is an advisor on the project.